For many, many reasons, this is a bad thing to do. First of all, that shorting bar is the last point of discharge for the high voltage power supply. When all else fails, this is designed to route the 3,500 volt plate supply safely to ground. 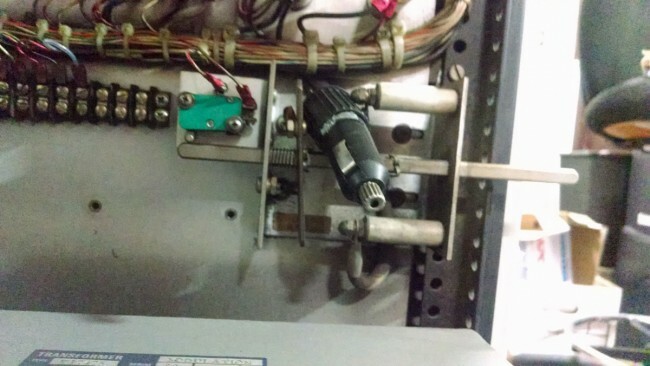 Having a stray 3,500 volts floating around inside of a transmitter is never a good idea. Fortunately, it was spotted and removed before anything bad happened. Secondly, it looks like somebody used a 12 VDC cigarette lighter plug as an insulating device. Wow, did they get lucky. This could have started a fire. As to exactly why it was there in the first place, I cannot rightly say. And this is why only properly trained people should be working on transmitter, especially tube type transmitters.